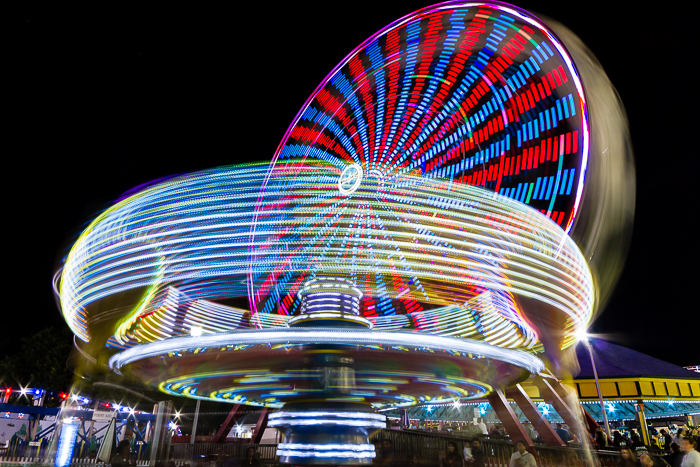 "Amusement" While I got a lot of successful images of the ferris wheel lit up with a variety of color patterns, this long exposure was my favorite combination of pattern in the ferris wheel and color/pattern in the foreground ride. Canon 7D, Rokinon 14mm f/2.8, 2.5 seconds, f/16, ISO 100. All right, this might be a little "off-brand" for Whimbrel Nature (emphasis on the nature) and quite a contrast to my two recent wilderness posts, but I also enjoy and specialize in night photography. While I particularly like to do more nature-related night photography, including astrophotography, the genre also frequently involves human structures and activities. 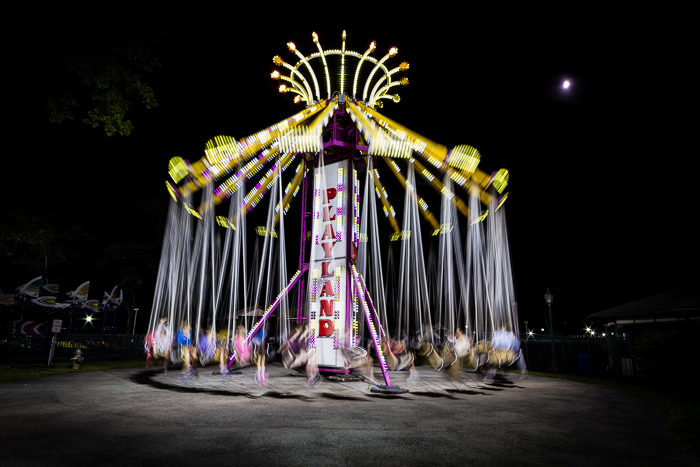 Recently I had a chance to photograph with my friend and fellow night photographer Peter Nagy at Rye Playland, a Westchester County Art Deco style amusement park on the Long Island Sound that opened in 1928. How could I pass up a chance to play around photographing at night, developing my skills, and hanging out with a great guy? In today's post, I thought I'd share some of my favorite images from the evening. "It Don't Mean A Thing..." Although I got some great spinning images from this ride, my favorite two images were taken before the ride began to rotate. In this image, riders wait impatiently for the ride to start and swing back and forth as much as they are able. The movement of the riders gave just enough blur to mask most individual features and clothing, giving the image a timeless feel, heightened by the black and white treatment. Canon 7D, Rokinon 14mm f/2.8, 2.5 seconds, f/16, ISO 100. 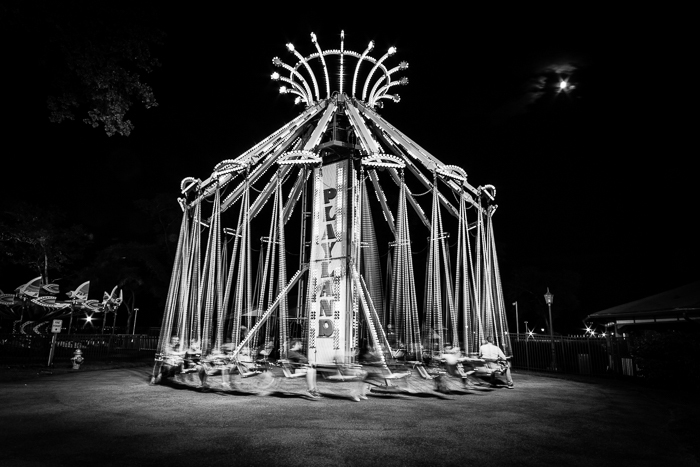 Some of my favorite images from the evening came from the Playland Yo-Yo, a classic swing ride. This ride was tucked away in a corner facing the Sound, so it was darker than other rides. The lights on the ride itself, as well as one overhead light produced a circular spotlight effect on the ride that heightened the drama. The nearing-full moon added a nice additional compositional element. "It Don't Mean A Thing..." shows the riders swinging impatiently back and forth, waiting for the ride to begin. The motion blur helps mask individual features and clothing, making this image feel like it could just as easily be from the 50's or 60's as from 2017. Converting to black and white added to the timeless effect and heightened the drama of the image. I enhanced the spotlight effect on the ride from the ambient lighting by using a very strong vignette. The symmetry and balance in this image works; with the structure on the right balancing out the background ride on the left, and the moon and clouds balanced by the barely lit tree limb. The symmetry in this case helps emphasize the dynamism (and restlessness) in the riders. "I've Got No Strings" The Playland Yo-Yo classic swing ride as the ride starts and raises the riders up in the air a bit before it starts rotating. Canon 7D, Rokinon 14mm f/2.8, 2.5 seconds, f/16, ISO 100. "I've Got No Strings" is another image from the the Yo-Yo. Normally I'd edit down to one, but I really like both these images and think they communicate different ideas. While I really like the black and white treatment of the image above, in this case I had to leave the color, otherwise the riders are too blurred and blend into the rest of the image. Thus losing an important aspect of this image for me. The bouncing up and down and then raising into the air at the beginning of the ride really made the riders look like puppets. While complimentary in content to the previous image, that image made me think more of impatience to be entertained; this image made me think more of our need for artificial stimulation to induce happiness. I don't know if it was the fact that it was nighttime, or the huge crowds of people, but it tended to bring out the darker interpretations of amusement park subjects in me this particular evening. I also really like how the front shadows are pretty normal, while the riders are blurred and abstract. 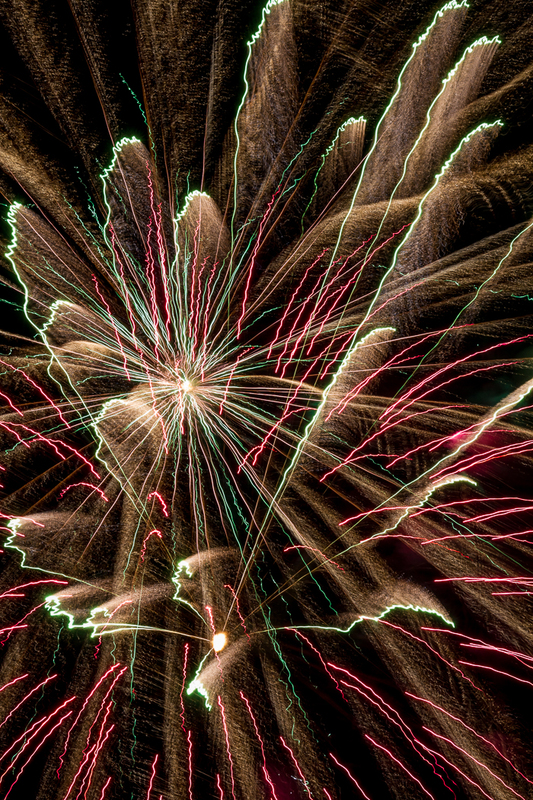 "Painting The Sky" For this image of several fireworks bursts, I slowly zoomed my lens in and out during part of some of the bursts, giving a very interesting effect. Canon 7D, Sigma 70-300mm f/4-5.6 DG APO lens, 10 seconds, f/16, ISO 100. 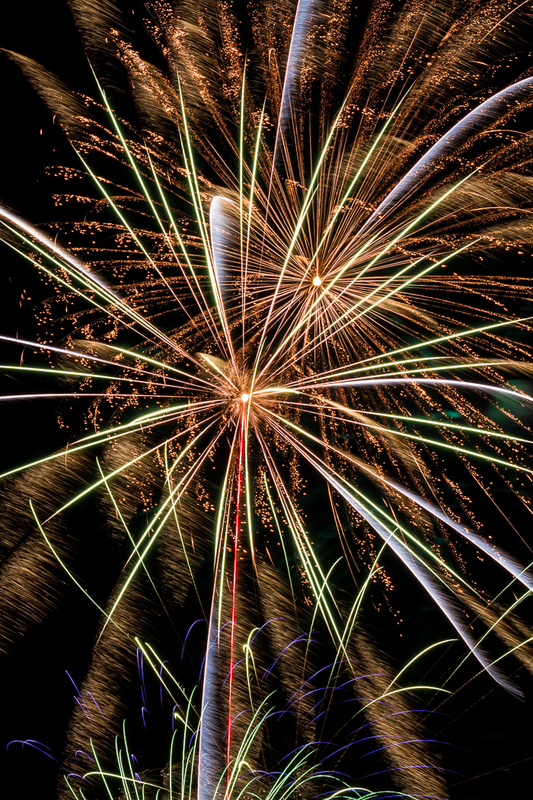 Finally, I'll leave you with a couple of firework abstracts from the evening's fireworks display. 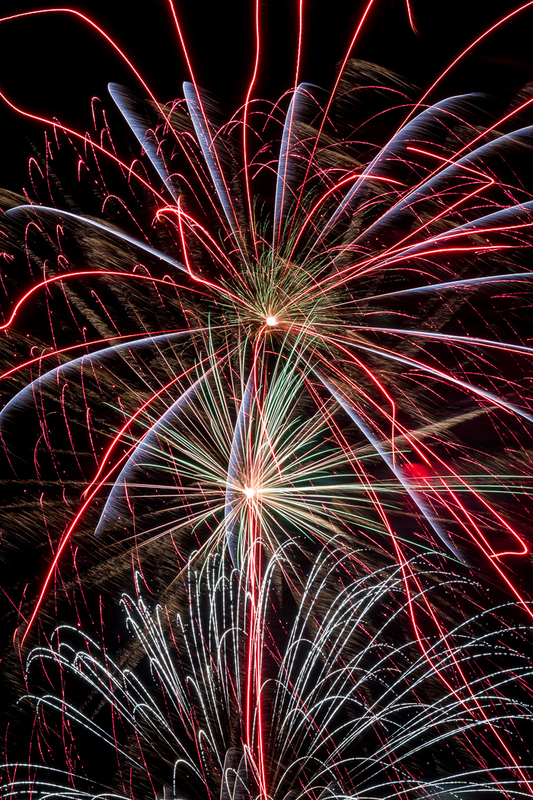 I started out shooting wide, but the foreground wasn't really working for me and the fireworks ended up being shot basically straight up, rather than out over the Sound. So, I quickly switched to my telephoto to shoot isolations instead. Enjoy! "All That Glitters" This was a more standard image. I don't think I did any zooming during this exposure. But the sparkling trailers from the shells, combined with a slight breeze created some interest. Canon 7D, Sigma 70-300mm f/4-5.6 DG APO lens, 10 seconds, f/16, ISO 100. "Painting The Sky 2" I think I did a bit more subtle zooming during part of this one. Canon 7D, Sigma 70-300mm f/4-5.6 DG APO lens, 10 seconds, f/16, ISO 100. Always great to be shooting with you, even in the short intervals that we lose track of one another in the pursuit of " the light"
I did enjoy the blog and the images - good job !